Grab a coffee friends, you're going to need it today! Why? Oh, we're going to dip our toes into my gene pool and that requires at least caffeine, if not booze. Along with my olive complexion and tendency to break out around important occasions, I was blessed with what my family lovingly calls a "turkey gobbler". If that cute little moniker didn't tip you off, a turkey gobbler is a thick double chin that begins to sag and wobble as time and gravity take their toll on skin elasticity. I also happen to gain weight in my face first and have a very tough time kicking it to the curb when I'm in the process of losing weight. Even on my wedding day, which was, without a doubt, the most fit and trim day of my life, I had a noticeable chunk under my chin (and I would guess the photo below was edited). As I've gotten older, I've realized that even when I am in shape and at an appropriate weight for my frame, my gobbler never gives up the gobble. That bad boy seems to be here to stay and, unfortunately, I have seen my future and it is not good. So this summer I decided to stop jutting my chin out in photos and to do something more permanent about my double chin(s). Off I went to Advanced Cosmetic Surgery, and at the advice of my friend Leslie, met the amazing Dr. McFadden and his right hand woman, nurse practitioner Holland. Dr. McFadden met with me to chat about my genetics and if my chins met the criteria for Kybella, an injectable that destroys fat cells. 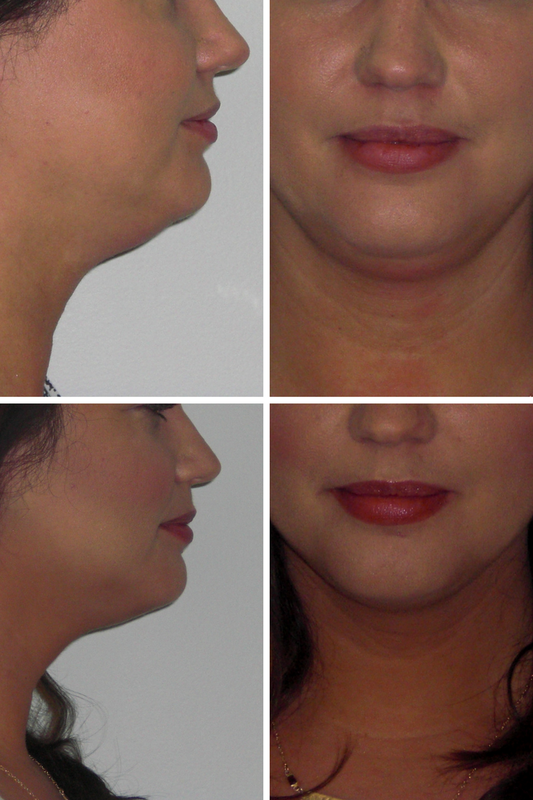 I got the scoop on Kybella and was thrilled to hear that once those fat cells are destroyed, they can no longer store fat and therefor the fat reduction is considered "permanent" (read more about Kybella here). Dr. McFadden explained that, of course, if I gained a substantial amount of weight he couldn't make promises about weight gain around my face, but Kybella is considered a permanent solution to destroying my gobbler! Needless to say that I was ready to roll the second he deemed me a candidate (and that moment might have been the one time I was thrilled to have a family history of a double chin)! After my chat with Dr. McFadden, Holland and I got to work prepping for my first round of Kybella. Each patient/double chin is different - some only require one round, some need two and Holland suspected I would need three. Insert fancy girl emoji and an eye roll here. Let me just say that I have never met anyone quite like Holland. She is the most kind, reassuring, intelligent woman - and she genuinely listens to every single word you say. I would let Holland work her magic on any part of me at this point, but at our first meeting, we stuck to my double chin. Step Two is to get your chin and neck area numbed to death. Using a combo of ice and topical numbing cream, Holland lets you hang out until you can't feel your gobbler. You'll probably sit for twenty minutes or so, which is a perfect time to catch up on celeb gossip or respond to emails. I'll let you guess which option I chose. Step Three involves Holland placing what amounts to a temporary tattoo in a grid pattern on your chin fat to mark her injection sites. and Step Four is the part everyone dreads: the needles. BUT, let me say this, the needles are so very small that you don't feel them at all. The actual Kybella does sting as it settles under your skin but I promise you that it isn't at all painful. Unpleasant, yes. Painful? No. By the time Holland was working on my last row of injections, the first few rows had already stopped stinging. Holland has had the procedure done herself so she knows exactly what you're feeling and is always willing to take a break if you need one. I never needed one and honestly was surprised how quickly it went once it was all over! And that's it! Really, it's that simple. Recovery after injections includes swelling - and the medical professionals use the term "bull frogging" to describe the shape of the swelling. I'm not going to lie, the swelling feels weird (kind of jiggly) but it is not at all as dramatic as "bull frogging" sounds. In fact, I left Advanced Cosmetic Surgery and went for a manicure! I only had one tiny bruise after Round 1 and it was under my chin, so most people never saw it. The shots below detail week one of recovery - from leaving the office on June 9th to 24 hours after injections, three days post injections and 7 days post injections. None of these photos are edited or I would have removed my pimples and grey hairs. Obviously, all of my swelling was gone within a week and the first round progress was already starting to show! By the time Round 2 rolled around, I was so excited to get into the office and get going. I experienced even less stinging/burning that round and even less swelling! I did have two bruises but you can see below that they were well hidden under my chin and not something I even bothered to cover with make up. By early August, I could see major changes in my jaw line - I focused on what I looked like from the side but was also noticing some small differences around the front of my chin that was really slimming out the shape of my face. Before each round I was weighed and my weight stayed consistent, meaning the Kybella was absolutely working it's magic! At the end of Round 2 I went back to see Holland and assess my need for another round. We both voted yes to another round of Kybella but, as fate would have it, I happened to have my toddler with me that day, so we decided to just shoot progress photos and schedule Round 3 for another day. Ya'll, when I saw those After photos, I could not believe the difference after just two rounds of Kybella and three short months. And here they are next to my Before photos. Uh, say what?! That change is undeniable. I literally could not be more pleased with the results! As most of you have probably figured out, I haven't been able to make it back for Round 3 because shortly after these photos were taken, we found out I was pregnant with the baby we sadly lost, and then became immediately pregnant with our baby girl. Needless to say, I am so looking forward to heading back to Holland and crew at Advanced Cosmetic Surgery once things have settled down in my post postpartum body to make Round Three a reality! You can find Advanced Cosmetic Surgery on Facebook, Instagram and their website - and I highly recommend joining their email list for specials on everything from Kybella to micro-blading! Many, many thanks to Leslie (who has since moved on to start her own company! ), Holland, Dr. McFadden and the entire team at Advanced Cosmetic Surgery for walking me through this process and partnering with me on this post! While I was provided services for my review, the results and experience are all mine and honestly documented. "My gobbler never gives up the gobble." DYING. Wow, this is like the most interesting review ever! I love that you are so open and honest about it. And I love even more that you had amazing results! You look great! You know I can't give a boring review! If it love something, I LOVE IT! And if I don't like something....well, that won't be a secret either ;-) Hope you're feeling well mama! Keep posting Hawaii pics so I can live vicariously through you! This is awesome. Do you happen to know the cost ( at least ballpark) of what this would cost? Hey Jessica! Somewhat like Botox, the price is determined by how many vials of Kybella each person needs - each vial is around $1,200 and how much you need is based on skin elasticity and how much pudge your chin carries. 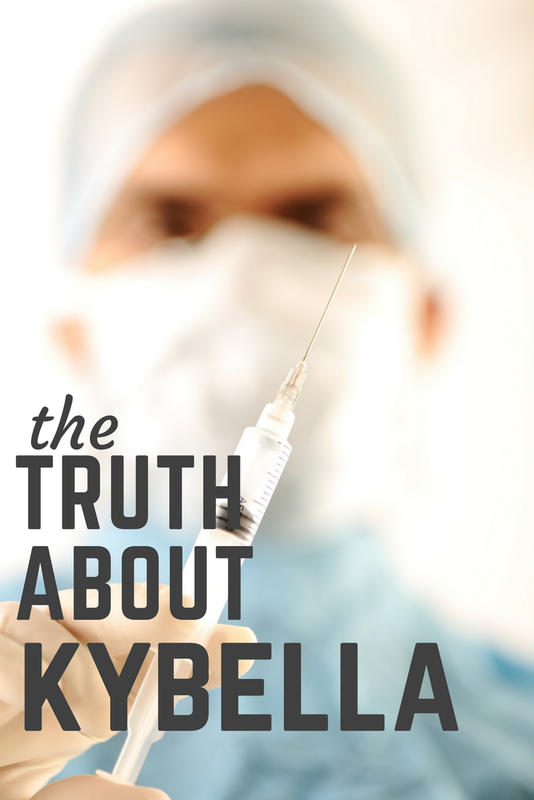 If you're local to Greenville, Advanced Cosmetic Surgery is hosting a Kybella event in March and there will be specials - I chatted with their marketing coordinator today and she said to sign up for their emails and details will go out ASAP! Hope that helps! I read this post and decided to check out Advance Cosmetic Surgery's website to see what services they provide. I just made an appointment for microblading. Eeek! Oh Brandi, Holland does microblading too! If she does yours, you will love her! All of the girls in the office are so great - and hello, I want microblading so badly! Send me your before and afters! My appointment is the Feb 28th @ 1:15 so you'll have before and after photos soon! It's with Ashley, though. I stalked her on Facebook and she looks like she does fabulous work as well. Yes! So soon!! You'll love Ashley, I haven't met a single person at ACS who I didn't love, which is pretty important since I let them inject things into my face :-) I literally can't wait to see you pics! This is amazing, Steph! I have the same chin "problem." My entire family has it. It doesn't matter how much I weigh, I always have a double chin. Ugh. Once I'm done nursing and ready to focus on me, I think I'll be looking into this. :) You look great! I have wanted this for so long! As soon as I'm done nursing the fetus I'm currently incubating, me and the husband are going to do it together as a couple. So romantic. So understandably if you gain weight after, the results might be minimized, but what were your results after pregnancy? You obviously would gain weight for it, but did it seem to undo the work on your neck? Thank you for your detailed description + pics of your treatment, it is by FAR the most comprehensive and engaging one I have yet to read. p.s. You do NOT have a double chin in your wedding photo, you looked spectacular then & now! !